MOUTH: Persistent effect in the mouth brings out the elegance of its tannins which enhaces its balance and roudness. Vineyards are located in Pago Los Llanos. Fermentation of selected grapes in stainless steel tanks at controlled temperature. Aging in American oak casks for 16 months followed by 12 months in the bottle before being released in the market. 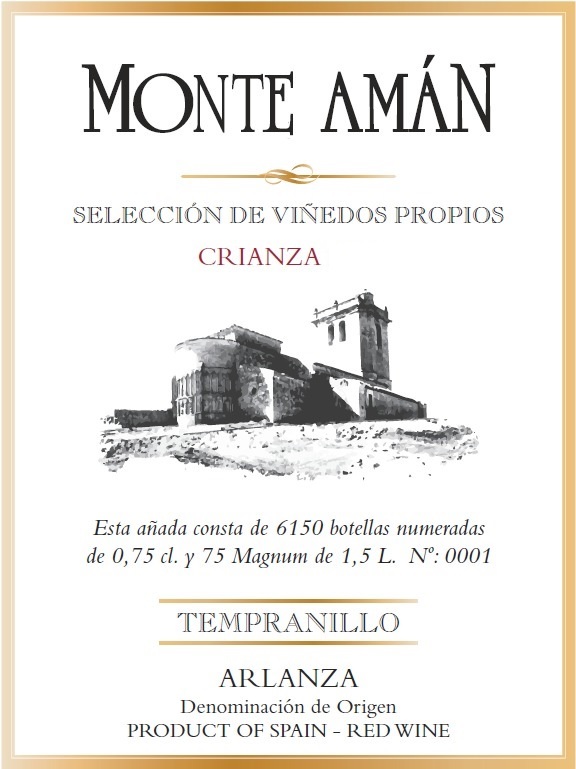 The Monte Amán S.L. bodegas and vineyards are situated in Castrillo Solarana. The municipal district and area belong to the region of Ribera del Arlanza where the tradition of elaborating wine and cultivating vines goes back to Roman times, in the III century, having vestige in the region of Lara and La Sierra de Covarrubias. In the Visigoth times, vineyards were cultivated in Quintanilla de las Viñas, but it is in the 9th and 10th centuries that the viticultural repopulation of Ribera del Arlanza is produced. Our undertaking begins in 1985, with a constantly expanding grape plantation of 30has, consisting of 95% Tinta del país (Tempranillo) and 5% Cabernet Sauvignon. In 1989 the Barbadillo García family decided to build the industrial premises with modern installations, with the aim of producing quality wines. Later on the age in American oak casks.